Gatlinburg is a family vacation destination with many attractions, shops, crafts, and plenty of Gatlinburg rental cabins from which to choose. Gatlinburg offers shopping, bungee jumping, putt-putt games, aquarium, space needle, winter sports, theaters and much, much more! 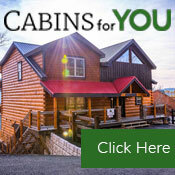 Gatlinburg Rental Cabins website is your guide to thousands of cabins in the Gatlinburg area. These rental cabins feature all the comforts of home, including heating and air conditioning, fully equipped kitchens, fireplaces, outdoor grills and beautiful mountain and woodland views provided by the National Park. Most of these Gatlinburg cabins also have hot tubs, game rooms, and satellite TV. You'll love your next Gatlinburg cabin! 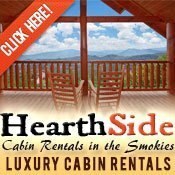 This site will guide you to the best rental cabins in Gatlinburg and the most fun that you will have in the Smokies. Find that perfect rental company that offers the perfect rental cabin. 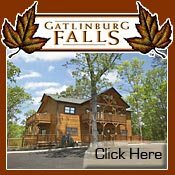 Whether you desire a one bedroom honeymoon getaway, or a 12 bedroom family retreat in Gatlinburg, Gatlinburg Rental Cabins is your best choice for finding the right cabin. Gatlinburg rental cabins make lasting memories. Learn more about Smoky Mountain cabins in Pigeon Forge, Sevierville, and Wears Valley. 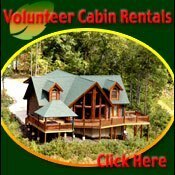 Once you've driven through the beautiful Wears Valley community in the Great Smoky Mountains, you'll understand why Volunteer Cabin Rentals is one of the most sought-after overnight rental companies in the area. We offer a wide array of luxury cabins that take advantage of the spectacular views available in our little neck of the woods, whether it's from a high mountain ridge perch or from the bucolic setting of the rolling valley floor itself. Our properties are convenient to Pigeon Forge and Gatlinburg, which means you're never more than just a few minutes away from all the fun and excitement of the Smokies. Book us online at 800-808-3903. At Gatlinburg Falls Resort, we take the concept of log cabins to a new level, showcasing an attractive selection of Heritage Log Homes that range in size from one to nine bedrooms. This flexible inventory means that whether you're traveling as a couple or as part of a large family reunion, church group or business, we have one of the best selections of Gatlinburg rental cabins to choose from. Not only are our properties capable of sleeping as many as 32 guests in one location, all our cabins are packed with amenities and are nestled on large, heavily wooded lots for privacy and luxury. Book with us online today! Just because a Smoky Mountain cabin is your lodging of choice doesn't mean that you have to settle for a rustic vacation lifestyle. 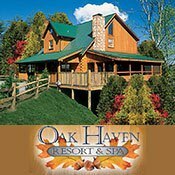 At Oak Haven Resort And Spa, we know how to spoil our guests thanks to a slate of amenities that leave you wanting to call our rental cabins home. We offer facilities like an onsite day spa, swimming pool and basketball court, not to mention being an easy drive from all the attractions, restaurants and shops of Gatlinburg. The cabins themselves are designed for comfort and luxury thanks to features like free wireless Internet, daily housekeeping, full kitchens, hot tubs, gas fireplaces and grills, big-screen TVs, DVD combos and game rooms. With a wide selection of one- to seven-bedroom cabins from which to choose, we're the best choice for your family vacation, church or corporate retreat, honeymoon or romantic getaway. Call us at 800-228-4016. 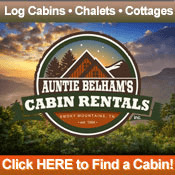 If you are looking for a rental cabin in the Gatlinburg area of Tennessee let us help you!. All of our cabins and chalets offer you privacy, yet you still have all of the attractions of Gatlinburg and the Smoky Mountain National Park nearby. If you are looking for a cabin in Gatlinburg we have just the cabin for you! Gatlinburg cabin rentals by Heartland Rentals 745 Powdermill Rd. Gatlinburg, Tn 37738. Are you wanting to rent a Cabin in Gatlinburg, Tennessee? Heartland Rentals would like to help you plan your vacation. Our rentals are just minutes from downtown Gatlinburg and most of the area attractions. 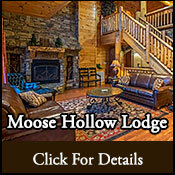 Please take your time to review our Gorgeous and Luxurious Honeymoon Cabins, and our Family Cabins. We offer easy online reservations or you may call the office and speak with one of our vacation specialist. Experience a whole new way of vacationing in the Smoky Mountains! Relax in a spectacular log cabin or chalet with hot tubs, Jacuzzis, fireplaces, and more! From cute & country to simply elegant...our southern hospitality will make your family vacation or honeymoon one to remember. Just minutes from Gatlinburg, Pigeon Forge, Dollywood, golfing, shopping and more. Imagine being able to book an entire resort facility exclusively for your next group event in the Smoky Mountains. At Moose Hollow Lodge near Gatlinburg, TN, that's exactly what they offer any group planning to host a wedding, corporate retreat, family reunion or church retreat. Their chapel/event center is fully equipped to accommodate the needs of virtually any group event, and thanks to the lodge's sprawling rental cabin, as many as 56 guests can stay on site at once, enjoying a wide slate of luxury amenities that include a heated indoor pool, gourmet kitchen, wet bar with card table, game room with arcade and even a 22-seat movie theater. When shopping for overnight rental cabins, the two things most vacationers look for are amenities and location. 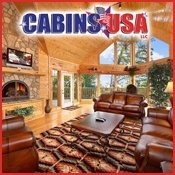 When you book your overnight accommodations with Cabins USA, you're connecting with a company that can deliver both. We have more than 250 cabins in our inventory, ranging from one to seven bedrooms. That means we can accommodate everything from honeymoons to group retreats and reunions. And our cabins are built for luxury and comfort, with features like mountain views, hot tubs, fireplaces, full kitchens, wireless Internet access and more. And with hundreds of cabin rentals located throughout the Pigeon Forge and Gatlinburg area, we're sure to have one that will give you convenient access to everything you're wanting to do in the Smokies. When choosing a cabin rental in the Smokies, it helps to book with a rental company that has a proven track record of offering the very best in overnight accommodations. At Hidden Mountain Resorts, we've been matching vacationers up with the right cabins and chalets for more than 25 years. And we've been able to enjoy such long-term success because we have hundreds of cabins from which to choose in Gatlinburg area. Our selection ranges from one-bedroom getaways to six-bedroom lodges designed to accommodate larger groups. Each property is unique, but we consistently offer features and amenities like outdoor hot tubs, whirlpool tubs, fireplaces, views, game rooms and fully equipped kitchens to name a few. You'll be able to get away from it all but still be just a few minutes' drive from all the attractions, restaurants, shops and events that make the Smokies so special. Come and enjoy the beauty of the Great Smoky Mountains with Fireside Chalets. Our cabins are convienient to famous outlet shopping, and all the exciting attractions of Pigeon Forge or spend time relaxing in the luxary of a beautiful mountain cabin. Fireside Chalets offer 1 to 7 bedroom cabins and chalets. Some offering whirlpools, hot tubs, internet access, swimming pool access, mountain views, or river views. 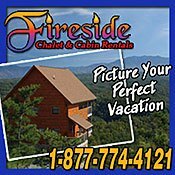 Call Fireside Chalets at 1-877-774-4121 to speak with a reservationist , the friendliest staff in the smokies. You can always view all of our cabins and chalets on our website. 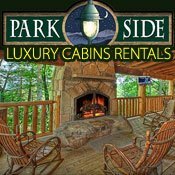 If your vacation plans include visiting Gatlinburg, Tennessee, or Great Smoky Mountains National Park, then discover what we have to offer at Parkside Cabin Rentals. Our Gatlinburg rental cabins and chalets have the advantage of being close to all the fun things you want to do in the Smokies, whether you're headed for the middle of town or the middle of nature. Whatever your itinerary has in store, you'll be able to settle in at the end of your day in one of our luxury properties and enjoy the peace and quiet of one of our getaway cabins. But we're not just convenient to Gatlinburg and the national park. We have properties that are just minutes from Pigeon Forge and Sevierville, opening you up to even more possibilities when it comes to attractions, shops and restaurants. Do you remember the feeling of being on vacation and not knowing what day it is? Come to the Smoky Mountains and enjoy a peaceful retreat from your daily grind. 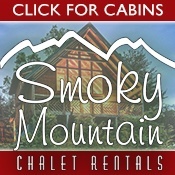 Smoky Mountain Chalet Rentals offers one to six bedroom cabin rentals to handle your personal, family and corporate needs. 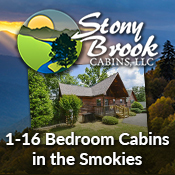 Our cabins and chalets are in secluded settings yet are only 5-15 minutes from Gatlinburg and Pigeon Forge, Tennessee. Once you have experienced a Smoky Mountain Chalet retreat...you'll be counting the days until you can come back! Play at fun attractions, shop at unique boutiques, and eat at top-notch restaurants before heading back to your Gatlinburg cabin for even more entertainment and extra-special memories - with Cabins for YOU! 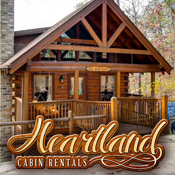 Our 320+ cabin rentals (ranging from 1-14 bedrooms) offer tons of amenity options, from homey conveniences (Wi-Fi, fully equipped kitchen, TV in every bedroom, gas/charcoal grill, etc.) to bonus features (home theater, game-filled rec room, private indoor pool, outdoor hot tub, etc.). No matter your vacation, be it a romantic retreat, an all-girls trip, or a family reunion, we have the perfect cabin for YOU! Dial 1.866.374.5977 to speak with your Vacation Specialist or book online with ease today.